1. 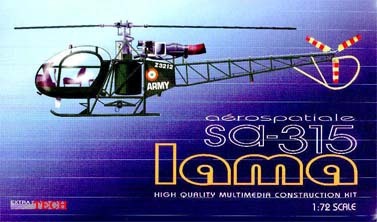 Extratech's SA.315 Lama #EXA7202 was released last week, the 1:72 SO.1221 Djinn will follow later this year (Extratech are re-visiting the preserved example at Le Bourget this month to finalise details). 2. Information direct from Miku's distributor Ilona Mullerova is that the 1:72 Miku AH-56A Cheyenne is now due 'in about two months'. I have some more information about possible sources for Miku resins. Firstly, I am happy to say that The Aviation Workshop are in the process of importing the three different 1:72 Miku Ecureuil kits, of which more below. Aeroclub are Ilona Mullerova's main contact in the UK, and they might be prevailed upon to bring some in as well. NZ Distribution, 22 Rue Pierre Semard, 51200 Epernay, France. Tel: +33 3 26564602, Fax: +33 3 26564603, (Nadege Zurawski & Chris Trouillard). 3. 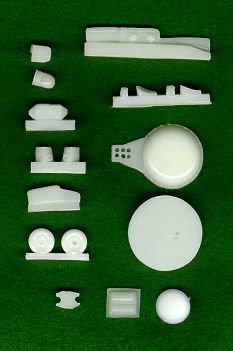 I have been loaned samples of the first 1:72 decals and accessories from The Aviation Workshop. These have been printed / cast in Australia by Hawkeye Models. Firstly we have #AVW-H06, which is a resin Sea King Filter Box for the RAN Sea King Mk.50 or the Royal Navy HC.4. This is a single resin casting plus a small piece of plastic strip. 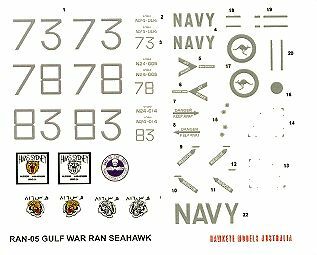 #AVW-HD05 is a set of decals for a US Navy SH-60B from 'USS Normandy' in D-Day Anniversary Markings, also sold under the Hawkeye label as #DS-029. This is an HSL-42 SH-60B, serial 425/HH, BuNo.162104, and the decals comprise the usual grey low-viz serials, titles, and insignia, plus a set of black 'invasion stripes' to go around the tail boom, the words 'UTAH' and 'OMAHA' for the nose, 'USS NORMANDY' for the engine covers, and an item of artwork for the left side of the cabin, the white backing for which is supplied separately. #AVW-HD02 is a set of decals for the one and only Canadian Armed Forces CH-143 / BK-117. You get serials, insignia, titles, and a few miscellaneous decals for 143106. This was the Canadian assembled test example C-FIOM which flew with the AETE (Aircraft Evaluation & Test Establishment) out of CFB Cold Lake, Alberta. According to 'Canadian Armed Forces Aircraft Finish & Markings (1968-1997)' by Patrick Martin, it returned to civilian registration after testing at Hollman & Vandenberg AFBs, carrying the serial 143106 for less than a year before returning to C-FIOM. The scheme was an overall white with orange or dayglo markings on the outer fin tips & most of the center fin. It also carried grey floation devices on the skids. Patrick's website has readable-sized versions of the paint specification diagrams, photos, and some description and history for every a/c type in the CAF inventory during the period '68-'97. Lastly, #AVW-H07 contains everything you need to make a RAN HS-816 S-70B-2 Seahawk as flown from HMAS Sydney and HMAS Darwin in the Gulf War. This combines Hawkeye's #RAN-05 Gulf War Seahawk decal set and their #CS-7 RAN S-70B-2 resin conversion set. The decals consist of a comprehensive set of low-viz markings for one of three different aircraft, N24-004/73, N24/009/78, or N24-014/83, plus five alternative items of artwork as worn by the three aircraft at different times. The resin set includes four radar warning receivers, chin mounted antenna, radome & sonabuoy launcher, belly antenna, port and starboard stores pylons, #2 radome, eyeball and mount, chaff/flare dispenser, and a pair of bulged main wheels with tie-downs. Comprehensive instructions are provided. The decals in these sets are printed on continuous clear decal film with no varnish overlay, so each one will need to be trimmed carefully. The printing itself looks extremely crisp, I would say that Hawkeye's decal production process seems to have improved substantially in the last year or so. I can make no comment on how easy they are to apply. The resin pieces are well cast, though the quality of the original masters, while good overall, is a little variable. All are usable although (as is normally the case with 'cottage-industry' resins) some require a little work to make them so. 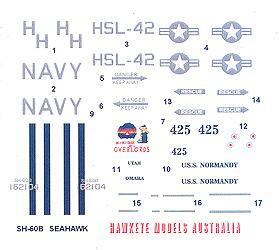 Also now available is #AVW-H02, which is a set of high skids and a set of decals for an Australian Army Kiowa. 4. The Aircraft Resource Centre is a rapidly expanding and useful website, always well worth a visit. Their latest project is an on-line instruction sheet library. I trust that readers of Heli-Kit News will make sure that no helicopter related items are missing. 5. Academy have released a 'new' set of 1:72 ground vehicles and accessories. The set contains a Jeep, a Kubelwagen, and a Kettenkrad, along with some 55-gallon drums, jerry-cans, and assorted crates/boxes. The reason I describe the set as 'new' is that they are obvious reworks of the old Hasegawa kits. The quality is excellent, some of the detailing has been improved, and buying this set means that you don't have to buy three Hasegawa sets to get the interesting stuff. (From Hasegawa, the Jeep was issued with a 37mm AT gun, the Kubelwagen was paired with a BMW motorcycle, and the Kettenkrad was paired with a Schwimmwagen.) This new offering will be good for those among us that need Jeeps for their Rotabuggys, and tow-tractors and scenery vehicles for their FA-223s. 6. Interavia have produced 1:72 etched brass detail sets for the Mi-24 Hind and the Ka-50 Black Shark, available from Tushino Aviapress. 7. Also seen at Tushino, Eastern Express have released a 1:72 Westland Wessex Antisubmarine Helicopter kit that I assume is another incarnation of the Frog / Novo mould, with decals for the Australian and British Navies. 8. S.T.O.R.M. have added the third set of static display images from Asian Aerospace 2000, featuring a Royal Brunei Air Force Blackhawk. This heavily customised version includes nose radar & undermounted ball turret plus wing-stub fuel tanks. Thanks to Scott Hemsley, Gary Madgwick, and Tony Morgan.